Rhythm Game made in 72 hours for Music Game Jam. Team of Cody Loyd and Ryan Ford. 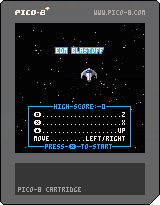 Pico-8 style controls.. directional pad plus z and x. Nice work! Party mode makes me feel good. Has a nice polish and everything that is a part of the game feels like it belongs there. This was really fun, I think you really nailed it on the difficulty level. Kind of a pat your head, rub your tummy thing going on.